The fascinating story of one of Christianity's most courageous heroes, Dietrich Bonhoeffer, is now abridged and adapted for students. This compelling account of Bonhoeffer's remarkable testimony—combined with historical, theological, and political elements and enhanced with photos—brings the story to life. How did Bonhoeffer become someone who would defend God's truth, even when it was a matter of life and death? How did he endure the hardships that came with his faithfulness? How might we respond similarly to injustices today? Bonhoeffer Student Edition is an excellent resource for parents to read with their children. It is an easily understandable book that will introduce your child to a man who understood sacrifice and service to God. 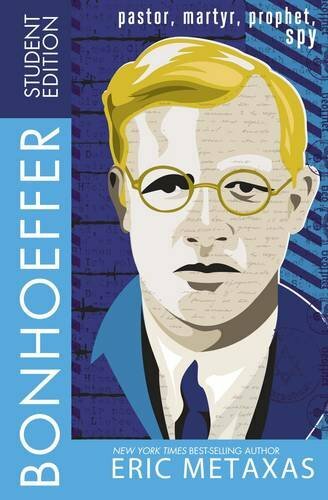 Historical information of the times and events surrounding and shaping Bonhoeffer's life. Discussion questions and exercises to provoke further thought and study. I received a pre-release copy and so the tables, timelines, etc. we're not yet available in a clean format. I can tell though that this is a book where having a physical copy as opposed to an ebook would be advantageous. The charts, etc. would be much larger and easier to reference. You can have your child read this book on their own but the experience will be so much richer if you read it as a family. Delve into the life of a sinner saved by grace who sought to serve his God in a perilous time. Eric Metaxas is the author of the New York Times bestseller Amazing Grace, Everything You Always Wanted to Know About God (But Were Afraid to Ask), Everything Else You Always Wanted to Know About God, and thirty children’s books. He is founder and host of Socrates in the City in New York City, where he lives with his wife and daughter. His writing has appeared in the New York Times, the Atlantic, Washington Post, Books & Culture, Christianity Today, Marks Hill Review, and Fist Things. He has written for VeggieTales and Rabbit Ears Productions, earning three Grammy nominations for Best Children’s Recording.